Eleanor Delano Roosevelt was the longest serving first lady in American history and arguably the most active. Even after her death, she is widely respected for her humanitarian work and often regarded as one of the most esteemed women in the world. 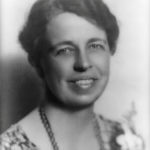 The wife of popular president Franklin Delano Roosevelt, Eleanor was a strong personality who had her own public life and was very outspoken on humanitarian and racial issues as well as women’s rights. When her husband suffered paralysis from polio, she even made public appearances and speeches on his behalf. Eleanor remained active in politics till her death and has been ranked by Gallup as one of the most admired personalities of the 20th Century. "A woman is like a tea bag – you can’t tell how strong she is until you put her in hot water." "One’s philosophy is not best expressed in words; it is expressed in the choices one makes… and the choices we make are ultimately our responsibility." "Never allow a person to tell you no who doesn’t have the power to say yes." "We gain strength, and courage, and confidence by each experience in which we really stop to look fear in the face… we must do that which we think we cannot."